Other then the Disney planning my other favorite part of my wedding planning process was the dress shopping and make up!! 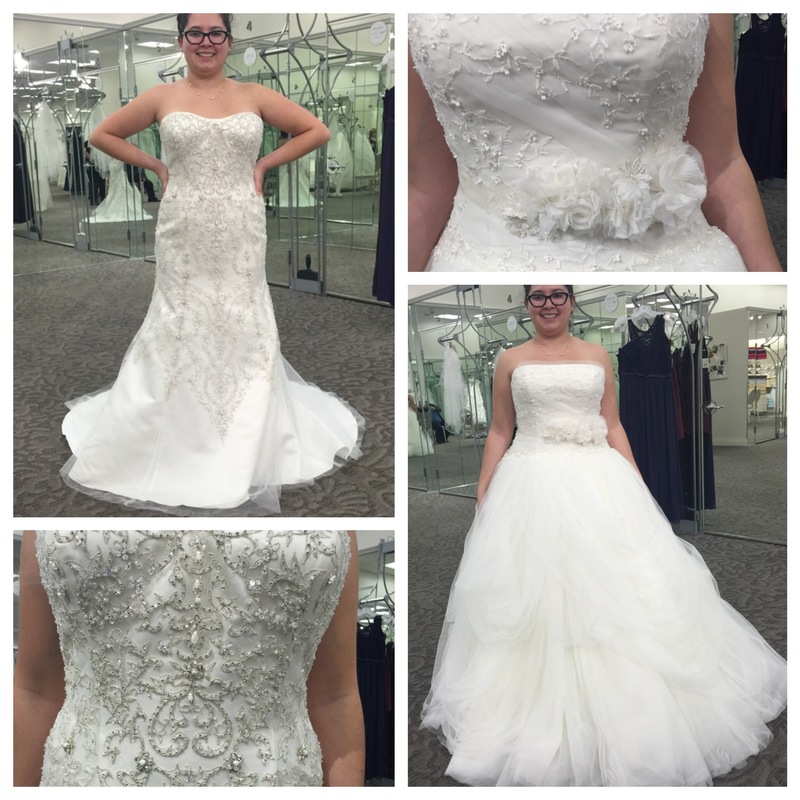 I went to David’s Bridal twice before I decided on a dress. 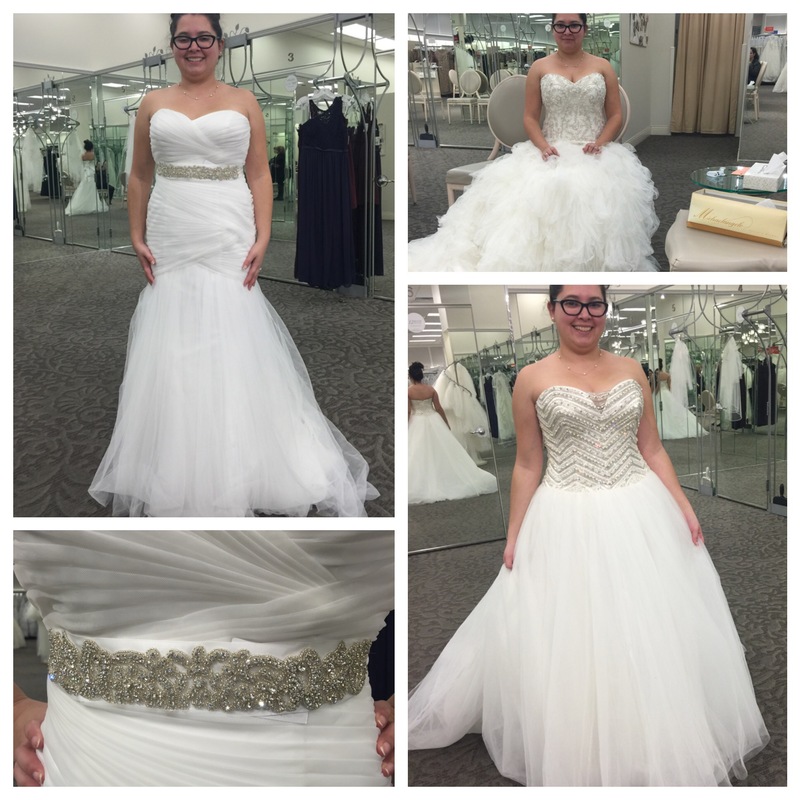 Below are a few I tried on. I pretty much knew exactly what I wanted which was a big ol’ ball gown but I was open to suggestions and I wasn’t afraid to fall in love with something else. In the end I did choose a ball gown and the bigger it was the better! I told the sales lady that I want the skirt so big I want to barely fit through the door. 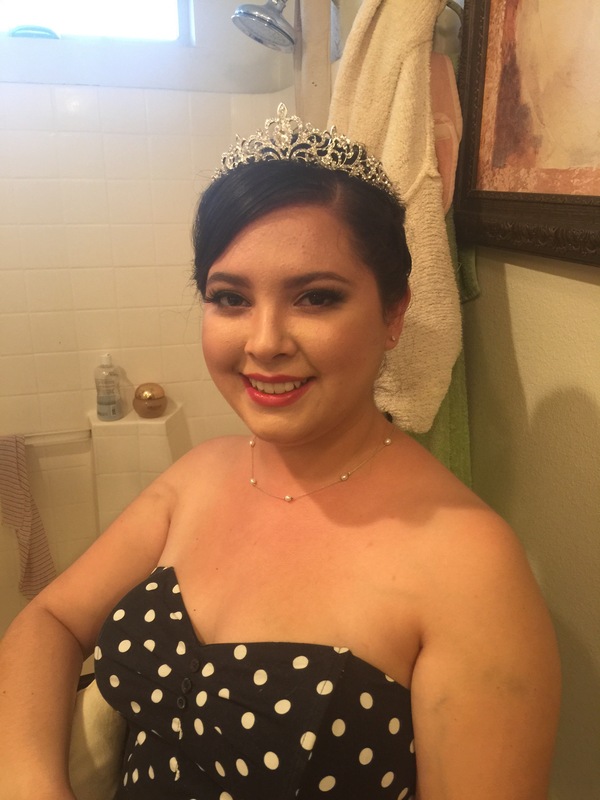 My hair and make up trial was interesting because the day after my wedding we had a photo shoot inside Disneyland before it opened. So I had to be in the Disneyland Hotel lobby at 5:40 am. I couldn’t ask/afford my hair and make up to be redone again that morning so I decided to sleep in my make up and hair! So with the trial I was able to see how my hair and make up would hold up and what I needed to do if anything. My mother was recommend a florist through her hair dresser and he was located in the flower disctrict of Downtown Los Angeles. 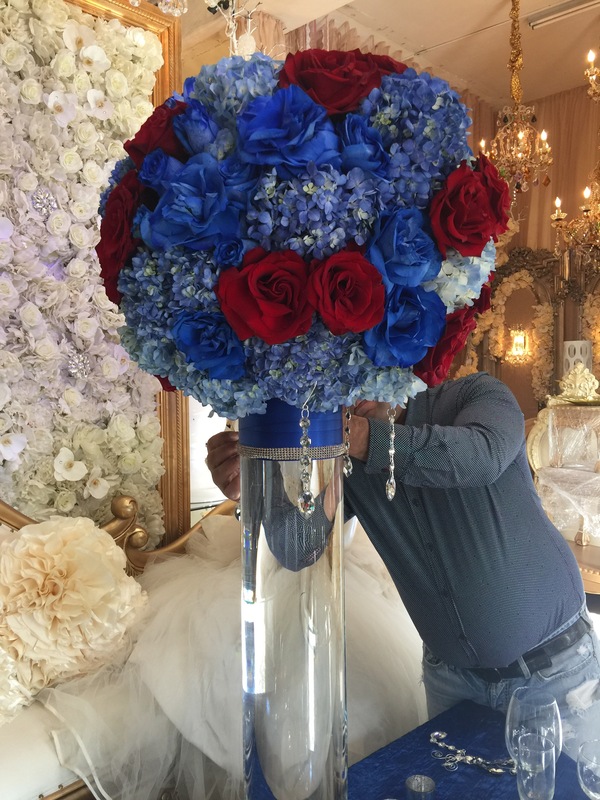 His store was stunning, immediately I knew that this was the perfect person to do my flowers. It was very modern and glam. 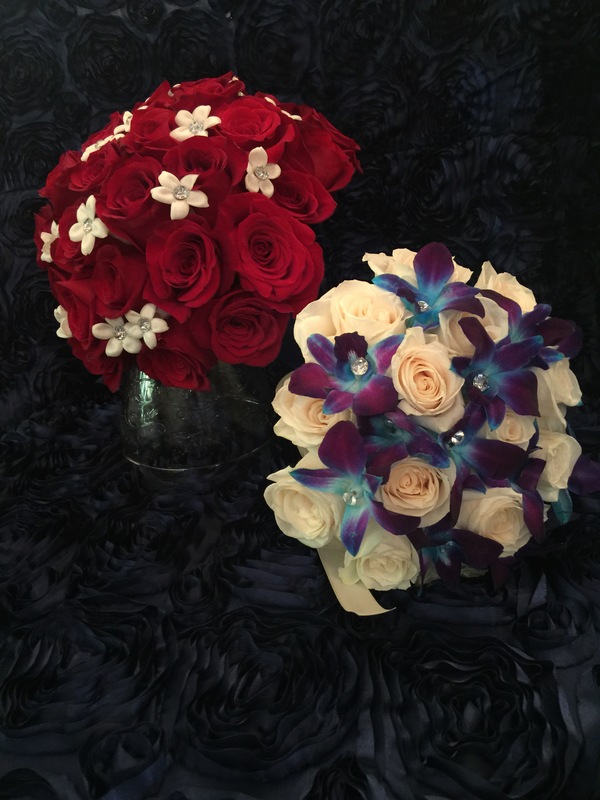 Below are some original mock ups of our flowers for the wedding. He was incredibly reasonable in price and never once hesitated when I wanted to tweak something. I’m very fortunate that my mother in law and maid of honor have a Silhouette and Circuit and helped me a lot with DIY project! Pictured below are what they did. One of my foodie guilty pleasure is funnel cake! I’m a sucker for funnel cake, I love them with strawberries, powdered sugar or boysenberry jam. Did you know that Disneyland has delicious funnel cake? Located at The Hungry Bear restaurant near Splash Mountain is where they are hidden. 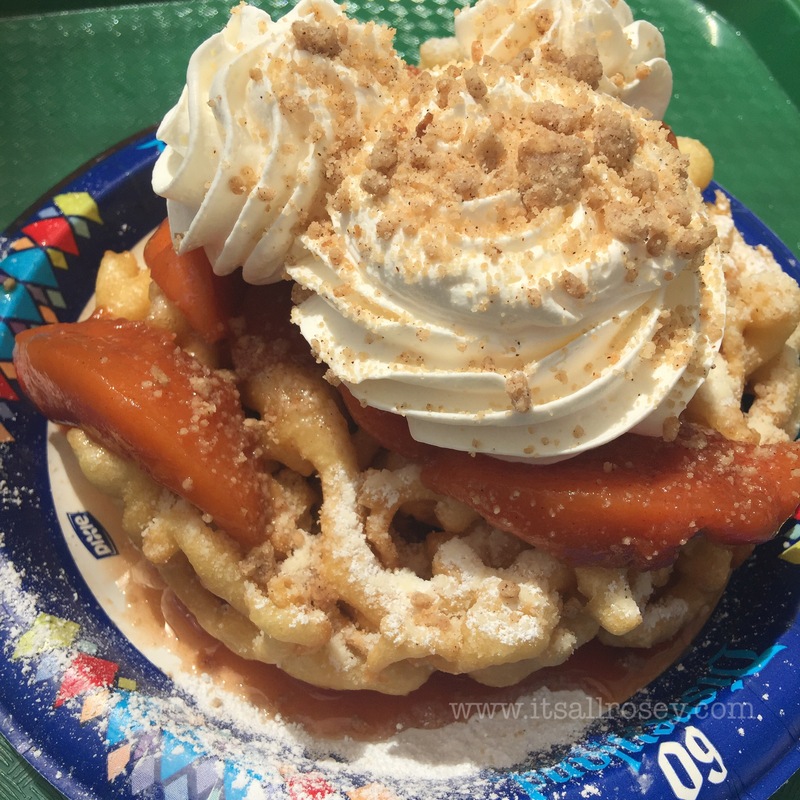 They have seasonal funnel cake flavors and right now they have peach cobbler and churro! So delicious! I highly recommend trying them when you’re there next!! 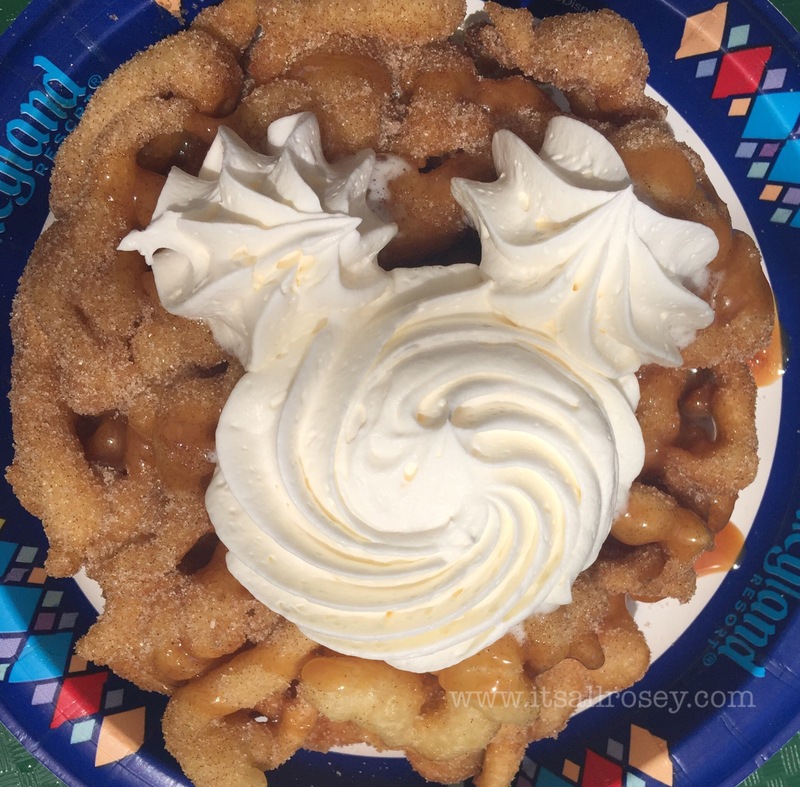 One of the best parts of the funnel cake is the whip cream! It’s not overly sweet and they’re definitely generous with their portions. Best part is your annual pass discount applies! Have you tried them yet? If your child is anything like mine your child has an unlimited amount of energy and can’t sit still for a minute! She also has sensory issues, she always craving more. She is constantly seeking more thrills. Walking inside Disneyland and California Adventure should be enough right? WRONG! That’s just a walk in a park for my child ( get it???) the list below guarantee my child will sleep all through the night. This place is great for both parents and kids. On the outside of the house there’s a lot of climbing and area to run around. It has a small slide and shaded seats for parents. Inside there’s a piano that plays silly noises, a goofy sofa and cute goofy family portraits. Practice the art of traverse climbing on the Cliff Hanger Traverse Rock Climb. Glide down a natural rock slide. Play with the Boulder Bears—rock formations that “bear” a striking resemblance to grizzly bear cubs. Climb up a trio of wooden lookout towers featuring authentic ranger gear, rope bridges and hidden surprises. Practice your park ranger skills as you slide down a tire suspended from a cable on the Sequoia Smokejumpers Training Tower. Walk through Big Sir—a towering 35-foot-tall redwood stump. Inspect a cross-section from the Millennium Tree and examine growth rings dating back 1,000 years. This is one of my favorite area’s of both parks, this place has benches, air conditioning and a large space for my child to run around! Siting in here is beautiful. Stunning images from your favorite Disney movies are projected onto the walls with music from the film. My Daughter loves the puddle park, it’s a great place for her to cool down and run around. Water squirts up from the ground in random places. One of the best parts of the puddle park is the two convenient changing rooms/ family bathrooms. You take take your family in there to dry off and use the potty. The best part of the disability pass is the fact you don’t have to wait in line. Sounds easy right? Well for the most part it is and Disney makes sure to help you any way they can. When got the pass they gave me this awesome booklet (pictured below) . Inside the booklet they go over each ride inside both California Adventure and Disneyland and describe attraction details in case you have someone that is sensitive to sound or light or if you have someone that doesn’t like to get wet, this booklet includes all those and more! I recommend that if your in the park or sign up for the disability pass ask for a booklet if they don’t give you one. In order to use the pass you might find a cast member located at a guest services podium. It’s very easy, just walk up and ask for a return ride for a specific ride. They will then scan your passes and tell you the time to return. Tip: Download the Disneyland app, it not only gives you wait times for rides but it also show’s where to find the nearest guest services to get a return time for rides. Finding the disability entrance may not always be easy, don’t hesitate to ask a cast member at any entrance to a ride also ask where the nearest exit is, a lot of the time my child has a melt down walking through the lines at Star Tours so I have to quickly get her out of there. I’m proud that my parents love all things Disney, I love all things Disney and now my child does. There is no better feeling then the butterflies if my tummy when I walk into Disneyland. Getting married at Disneyland has always been a dream of mine that I never thought was possible but thanks to my prince charming he made it a reality and we got married on May 16, 2016. Disneyland will always hold a special place in my heart because it’s where I got married but it also helped with my daughter open up. My daughter never really explored her surroundings and has trouble interacting with others. One day while we were at Disneyland we were eating breakfast at the Plaza Inn (for those who don’t know its a restaurant that has character dinning. ) my daughter saw Dale from across the restaurant, I wasn’t sure what her reaction was going to be since most kids are afraid of the giant heads. She slowly got closer to him and from the corner of his eye Dale seemed to catch of glimpse of Sophia Rose getting closer to him. He quickly turned around and hid behind the counter, Sophia Rose laughed so hard! She ran to where he was hiding and pointed at him and laughed. Being a mom with a child with Autism you appreciate the small things, you don’t take anything they do that “normal” kids have no problem doing for granted. So in that moment, she was interacting!! She’d point and laugh and look at her Dad and myself as if she was saying ” do you see this guy? He’s Hilarious!”. Disneyland has really helped my daughter feel safe and its a place where she can be herself. Everyone loves her sense of wonderment. She recently started to communicate with words, her vocabulary has really exploded so when she finds the words to say something, she says is with such excitement because most of the times it’s the first time she’s saying what’s coming out of her mouth. Whats your favorite Disneyland memory? I thought appropriately my first post should be about how Disney makes it a little easier to take my daughter to Disneyland. At first when I started taking my child to Disneyland she was a baby but when she turned two she was diagnosed with Autism. She can’t wait in line for more then 10 seconds without falling on the floor, scratching herself and pinching (herself or others). So the thought of taking her to Disneyland became daunting especially after hearing of the disability pass changed. When she turned three we bought her an annual pass because if we still got her in for free we’d have to sign her up for the disability pass with EACH visit. Signing up for a disability pass is quite easy. First thing after purchasing a pass is go straight to city hall located inside of Disneyland or the Chamber of Commerce inside California Adventure. Tip- GO TO CHAMBER OF COMMERCE the lines are significantly shorter. Let them know you interested in the disability pass and they will proceed to ask you a couple of easy questions. First question: Why does your child need a disability pass? My answer, she cant wait in line. Second question: Why? what happens if she has to wait in line? My answer, she’s self harms. Keep in mind that it expires every 60 days. Tip- when renewing your pass let them know you have it already and it makes it easier on the cast member to renew your pass. They will take her picture and add it to her annual pass. My daughters first picture we was red faced and screaming. Everyone experience is different of course, I’m just speaking about my personal experience.